“IN THE MOUTH OF MADNESS"
#C4InTheMouthOfMadness – Double Main Event! Tag Team Dream Match! 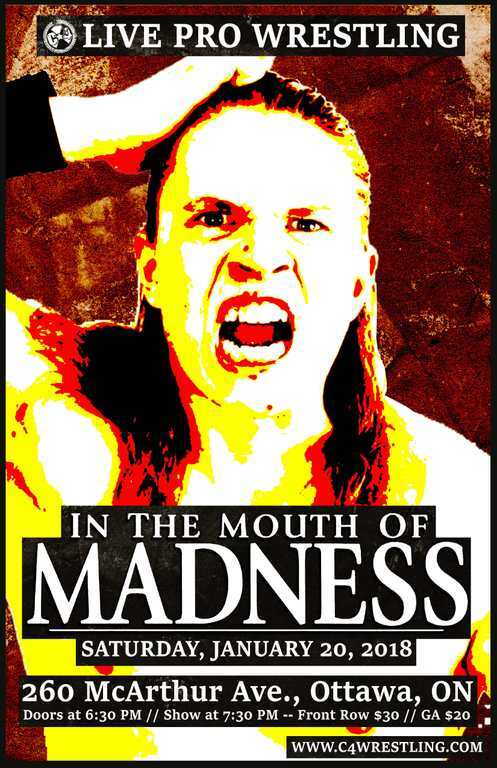 With the dawning of a new year rapidly approaching, we are also approaching our next huge event, #C4InTheMouthOfMadness! Following our absolutely insane 10th Anniversary weekend series of events, we are still reeling and trying to figure out what exactly is going on in C*4. This much is certain, C*4 Champion (and C*4 Underground Champion), “Diamond Tiger” Kobe Durst has aligned himself with former C*4 Champion, and leader of an assault on the very fabric of the promotion, Twiggy. Thanks to the interference of Twiggy, Evil UNO and “The Beast King” FTM, Kobe managed to retain his Championship against former Champions, Mathieu St. Jacques, and “Dirty” Buxx Belmar. Both nights saw Buxx and MSJ’s chances at reclaiming their former Gold, foiled by Twiggy, and now in hindsight, perhaps an elaborate plan that involved Durst himself. How deep does the relationship with Durst and Twiggy’s resistance go? And what happens next? 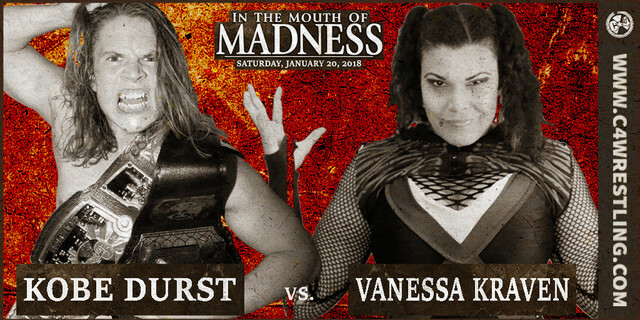 Well, on January 20th, we have a double main event, that will feature two huge matches, all stemming from the fallout of our tenth Anniversary weekend. First up, getting his first singles shot at the C*4 Championship he had to relinquish in the fall of 2015, “Dirty” Buxx Belmar will challenge “Diamond Tiger” Kobe Durst! On November 25th, Buxx did get his chance, however it was 24 hours removed from a brutal battle with Mathieu St. Jacques. And even then, it was competing against MSJ and Durst in a three-way. Well, on January 20th. One fall to a finish. No DQ. No Count-outs. Buxx gets his shot at becoming the first ever three-time C*4 Champion. On January 20th, for the first time since Summer 2015, Mathieu St. Jacques and Thomas Dubois will pair up together in a C*4 ring for tag team competition, as TDT, Tabarnak De Team returns for a one-night reunion! Next up for today, a dream match to many has been signed. 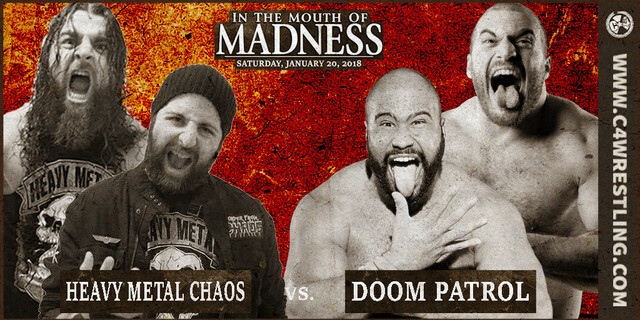 One of the top tag teams in the world today will collide with two of C*4's top talents, making their Ottawa debut as a tandem..
#C4InTheMouthOfMadness – Main Event shuffle due to injury! Plus more! 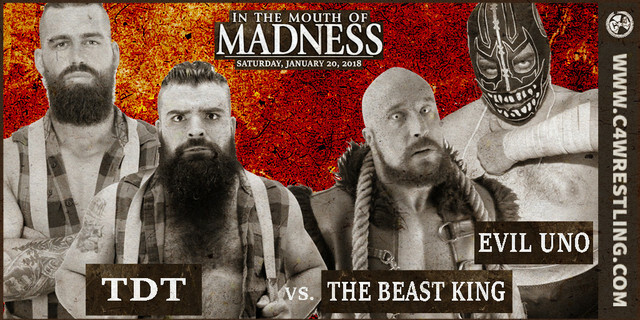 As the calendar changes to 2018, that means we are even closer to our next event – January 20th’s #C4InTheMouthOfMadness! Due to a knee injury, we regretfully must inform our fans that “Dirty” Buxx Belmar will not be medically cleared to compete on January 20st. While unfortunate for Buxx, this does open an opportunity for another challenger to come forward. After careful deliberation, Management has decided that Vanessa Kraven will be granted her first ever opportunity at the C*4 Championship! Next up, we are excited to announce the debut of a New England stand-out, as we welcome the debuting Josh Briggs. At 6’7, and amazing all around ability and potential, Nothing, Arizona’s Briggs is hoping to make 2018 a big year. 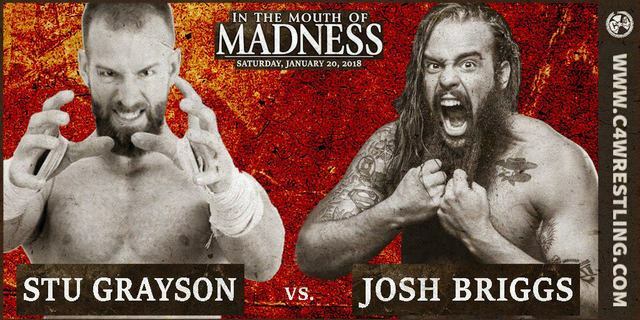 Briggs will have a massive challenge ahead of him at #C4InTheMouthOfMadness – as he will face off with one of the most decorated and talented men on the C*4 roster… Stu Grayson. Grayson, coming off a controversial match with his former partner Evil UNO in November, is clearly looking to make a statement in 2018 in C*4. Meanwhile Briggs is looking to make an impact in his first appearance. This will be a war! #C4InTheMouthOfMadess - Brute gets his Monkey! 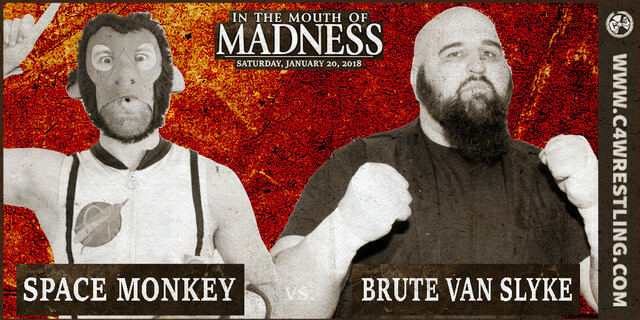 Back in November, we were unfortunately unable to deliver a signed match between the beloved Space Monkey, and the giant, Brute Van Slyke. 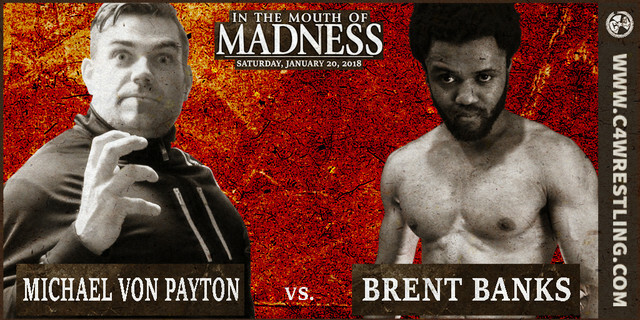 On January 20th, these two men will collide. Will Space Monkey make a successful return? Or will Brute make an example of the beloved primate? 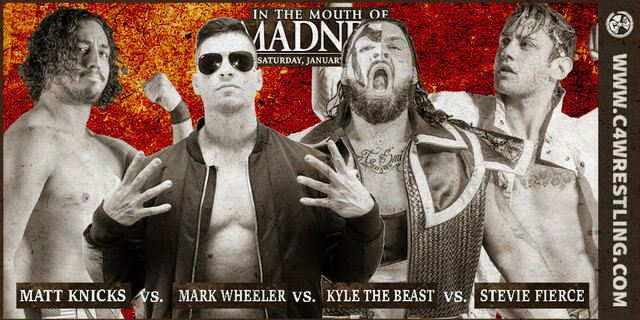 #C4InTheMoutOfMadness – Full card revealed! Three more high-intensity matches set! 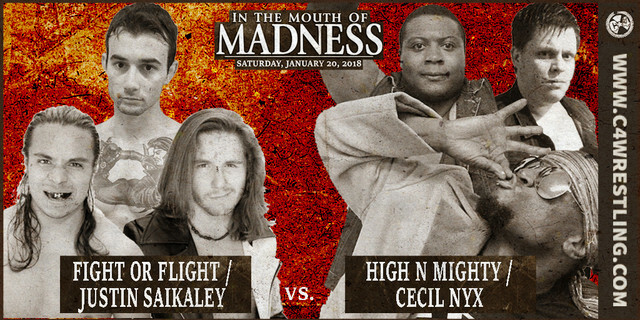 This Saturday night, C*4 rolls into the new year with an overloaded show, as we present #C4InTheMouthOfMadness! Without further delay, let’s get the rest of this huge card announced for all of you! First up, a six man tag team match that has the potential to steal the show! Former C*4 Tag Team Champions, Fight or Flight, join-up with the returning Justin Saikaley. This high-flying team will battle the even higher-flying tandem of High n’ Mighty. And joining his former Afterparty partner, Rukin, is the all healed-up from his gunshot wound, “The Curse” Cecil Nyx! Two men who could not have celebrated C*4’s tenth anniversary weekend in more drastically different ways, will collide on Saturday night. Brent Banks, celebrated a decade of C*4, with a win over Hallowicked. “MVP” Michael Von Payton brought back his “MVP Invitational”, putting his mask on the line, only to be humiliated and defeated by a trio of talented up and comers. This Saturday, Von Payton looks to start 2018 on a winning note… While Banks looks to continue his winning ways. 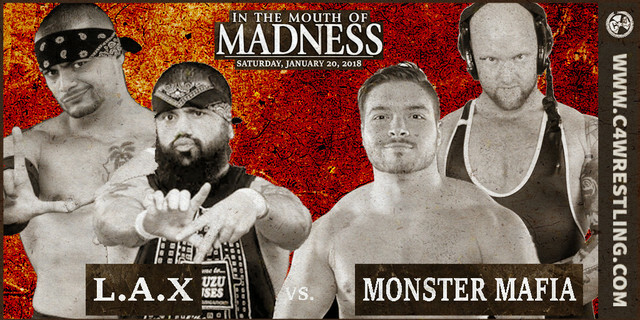 Rounding out our card for this Saturday night, we are excited to announce a match featuring three debuts, and another young man who has been turning heads and gaining traction, every show he competes on. This match could steal the show, as four talents all looking to impress C*4 fans and management, leave it all in the ring!